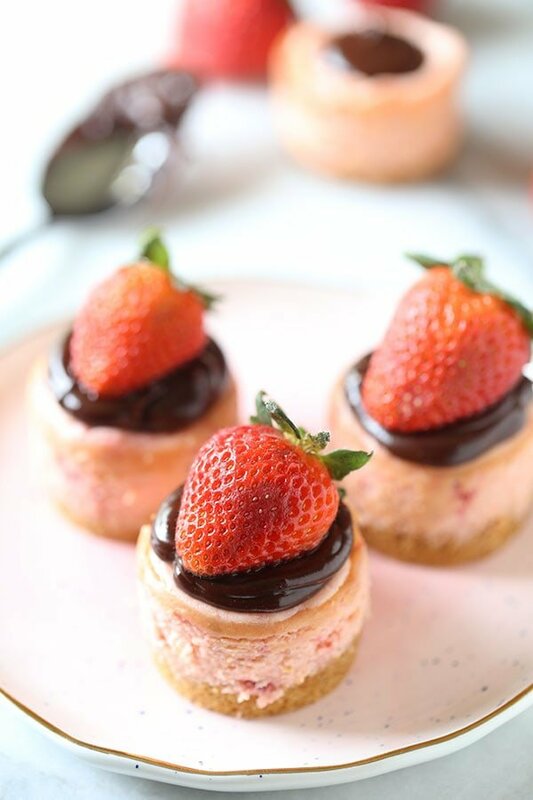 Chocolate Strawberry Mini Cheesecakes are perfectly easy, adorable, and transportable for the perfect Valentine’s Day dessert. Plus they can be made ahead of time! This post is sponsored by the National Milk Producer’s Federation. All opinions provided are my own. 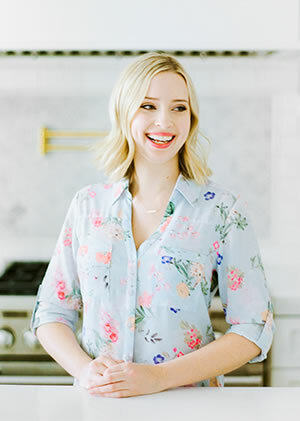 Thanks for supporting me in working with brands I love to bring you new recipes! Taste: Like a chocolate covered strawberry, but better! Texture: The crunchy buttery crust, smooth cheesecake filling, and fudgy chocolate ganache on top are pure heaven together. Ease: So much easier than making a full sized cheesecake, and cuter too! 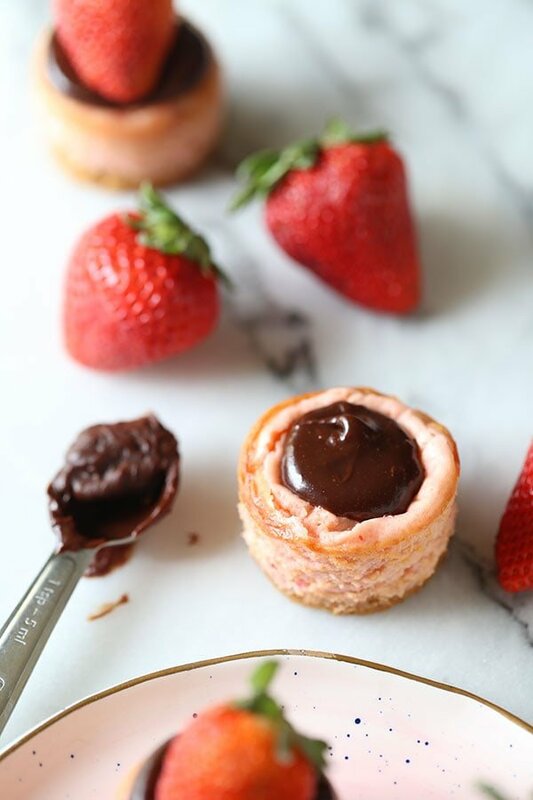 Pros: The perfect adorable Valentine’s Day dessert. Would I make this again? Absolutely I will! These practically vanished! How cute are these cheesecakes? I’m a sucker for anything mini and these are just way too fun. Actually, this recipe came about when my partner REAL® Seal challenged me to create the ultimate sweet treat perfect for Valentine’s Day. When working with real dairy (be sure to look out for that little red seal to ensure you’re buying genuine dairy made with milk from cows on U.S. dairy farms), there are so many baking options available. Dairy is basically a crucial component to most delicious baked goods. I actually overwhelmed myself with all the possible ways I could use REAL® Seal to create a scrumptious Valentine’s Day recipe! I thought back to when I was a kid and we celebrated Valentine’s Day at school. We’d all go from desk to desk handing out our Valentine’s Day cards, then get to munch on some sweet treats we all brought in (thanks to our parents). I thought of those artificially sweet grocery store Valentine’s Day treats that usually lined the classroom table and remembered even as a kid I didn’t like them. So I decided to create a recipe that was sweet and rich, but made with real ingredients and real flavors everyone adores. I decided on a recipe that could be made ahead of time and is easy to transport. That way, if you wanted to bring them to your kid’s classroom, or to a Galentine’s day party, or to your collegues at work, it would be super simple. By the way, for more recipes and inspiration, be sure to check out REAL® Seal on Facebook and Pinterest. 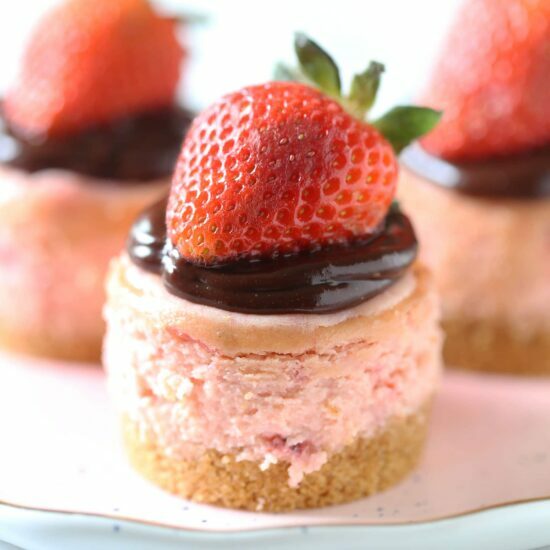 I used my beloved Mini Cheesecake Pan for this recipe, but if you don’t have one go ahead and use a standard muffin tin with paper liners sprayed with nonstick cooking spray. Also make sure to grease your mini cheesecake pan if you’re using that. We don’t want any sticking here since there is no baking! Make sure your cream cheese is completely at room temperature. You want to beat it very well so no lumps remain. However, once you add the egg be careful not to over beat, which can cause the cheesecakes to crack and deflate. Here’s a little sneaky plus though, even if these cheesecakes deflate it’s okay because that basically means more room for ganache on top! Make sure you chill the cheesecakes for at least 3 hours so they have the best shape, texture, and taste. 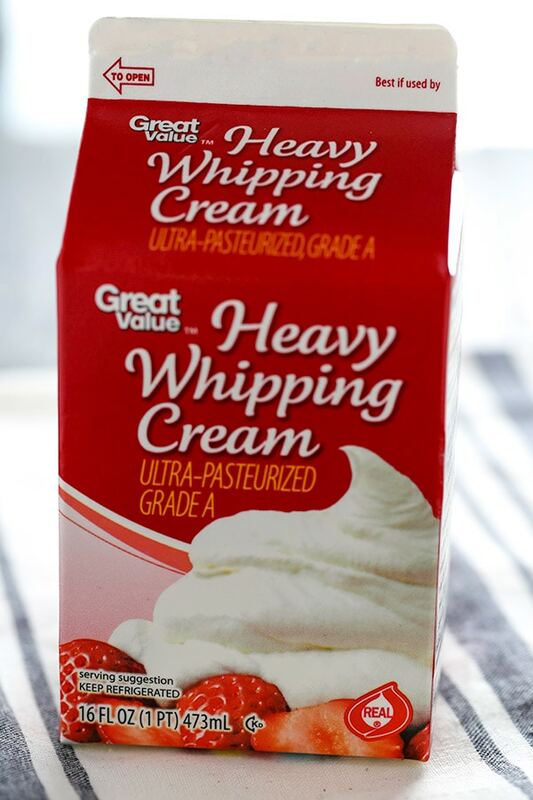 The other key is to be sure to use real full-fat cream cheese and cream that has little red REAL® Seal on the packaging to ensure you’re buying genuine dairy products that meet strict standards and are made with milk from cows on U.S. dairy farms. Nothing else quite compares!! Preheat the oven to 350°F. Lightly grease a 12-cup mini cheesecake pan with nonstick spray. Place the graham crackers in the bowl of a food processor and pulse until finely ground. Add in the melted butter and pulse until moistened. Divide the mixture among the cavities of the cheesecake pan, about 1 heaping tablespoon in each. Firmly press the crumbs into the bottom of each cavity (a shot glass or other small object makes easy work of this). In a large bowl, use an electric mixer to beat the cream cheese and sugar on medium-high speed until smooth and fluffy. Add the strawberry preserves, food coloring (if using), vanilla, and salt and beat until smooth. Add the egg and beat until just combined. Divide the mixture among each cavity. Bake for about 18 minutes, or until set. Let cool to room temperature. Cover with plastic wrap and let chill for at least 3 hours or overnight. Place the chocolate chips in a medium heatproof bowl. In a small saucepan heat the cream just until simmering. Pour over the chocolate chips. Let sit for 3 minutes before stirring until the mixture is melted and smooth. Allow to cool and thicken. 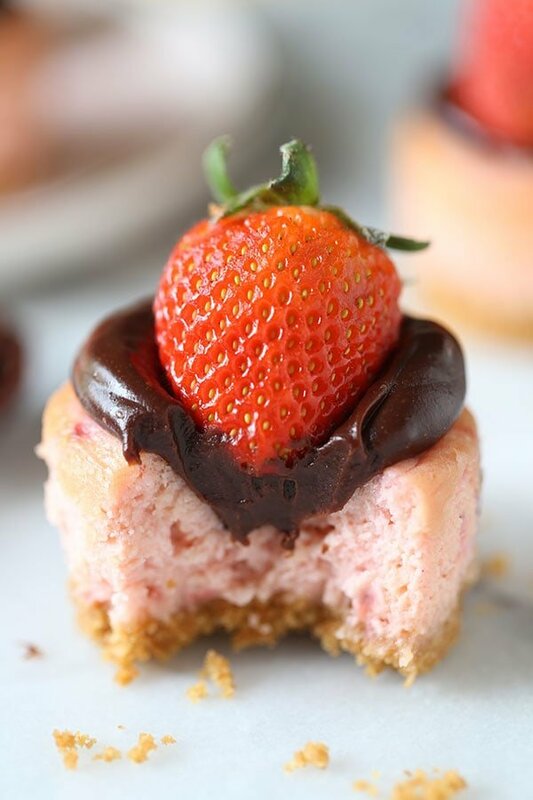 Top each cheesecake with the ganache, then press a strawberry into the ganache. Serve or cover and store in the fridge for up to 1 day. I got a mini cheesecake pan for Christmas but hadn’t used it yet, so I broke it in with these tonight. YUM! wow wow wow! It looks so tasty!!! Can you swap out raspberry preserves for strawberry and just put raspberries on top?